In April 2018, a man was shopping for ammunition at a gun store in Cape Coral when he accidentally discharged his semiautomatic handgun. While no one was injured in the incident, he did leave a bullet hole in the floor. Accidentally discharging your firearm isn’t a crime in Florida, but you can be held civilly liable for damages caused by your negligence. Keep your weapon in a holster or a safe. Off-body carry (not using a holster) is a common source of negligent discharge. Don’t carry your gun in a purse, briefcase or messenger bag. Similarly, make sure your gun is locked in a safe when it’s not on your person. This is the easiest way to prevent a child from accessing it. Don’t let anything enter the trigger guard. 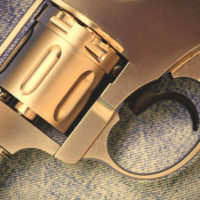 The trigger guard is a loop surrounding the trigger that prevents it from accidentally discharging. Your firearm may discharge if anything interferes with the trigger guard. For example, a man’s gun accidentally fired when a crease formed in his leather belt loop holster. The leather folded in through the trigger guard, acting like a finger on the trigger. Then the gun fired. Check your holster to ensure you don’t develop a similar problem. Understand and respect your firearm. Does your gun have a manual safety? Or a light trigger pull? If you don’t understand the features of your gun then you have no hope of operating it safely. Read the manual. Take a class. And don’t assume that just because you know how to safely operate one type of gun that you know how to operate another. Don’t handle your firearm unless it’s necessary. One cause of negligent discharge is adjusting your firearm, whether it’s in a holster or carried less safely. If your gun doesn’t fit comfortably in its holster then try a different holster. The more you handle your weapon unnecessarily the more likely you are to accidentally discharge it. For example, a man who took his gun to a movie theater near Seattle, Washington, accidentally shot a woman in the shoulder while adjusting his pistol. You run the risk of civil liability any time your failure to follow reasonable gun safety precautions results in injury to another person or to someone’s property. Contact an experienced attorney if you are the victim of negligent discharge. We can walk you through your legal options. Contact a Fort Myers personal injury attorney at The Pendas Law Firm today for a free consultation if you were injured by a negligent firearm discharge. We will help recover compensation for your injuries, including medical expenses, lost wages, and pain and suffering. The Pendas Law Firm also represents clients in the Fort Lauderdale, Orlando, Jacksonville, West Palm Beach, Tampa, Miami, Daytona Beach and Bradenton areas.